Rating: 5.2/10. From 135 votes. 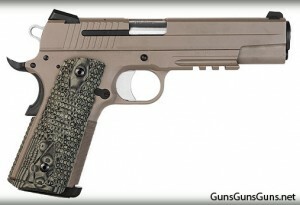 Summary: The description, specs, photo and pricing for the SIG Sauer 1911 Scorpion pistol. SIG Sauer’s 1911 Scorpion is a 1911-style pistol chambered in .45 ACP and built on a stainless steel frame with a stainless steel slide. The Scorpion sports a desert tan Cerakote finish and Hogue’s Magwell Grip Set, which combines grip plates and the main spring housing in an integrated magazine well extension that promotes rapid magazine changes. Manufactured from G10, the Magwell Grips provide strength and light weight, and they feature Hogue’s Piranha texture for retention and a multi-layer green and black pattern. Other features include a 5 lb. SAO trigger, an eight-round magazine and low-profile night sights. Note: SIG now offers a Carry version of this pistol. 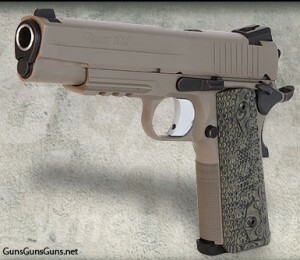 This entry was posted in .45 ACP, $1,001-$1,250, 1911, Full size, Semiauto, SIG Sauer on May 3, 2011 by Staff.